What’s changed over the last 12 months in social media? It’s been a big year in the world of social media, and so as 2012 draws to an end, we thought we’d take a look back at some of the biggest changes that this past year has seen. There’s no doubt that social media continues to evolve and it certainly isn’t going away anytime soon, especially now that many businesses have realised the marketing potential it holds for them. Of course one of the biggest hits of the year has been Pinterest, whose users have rocketed over the past 12 months, making it one of the most popular social media platforms and driving more referral traffic than Google, YouTube and LinkedIn combined. Facebook has also seen a lot of changes, the biggest being the much maligned introduction of Timeline. Controversy still exists over whether the new format has been good for businesses but the jury’s still out really on whether Timeline has improved brand engagement. The chart below shows how Timeline has affected some of the big name brands. Of course, this isn’t the only controversy that Facebook has seen as their entry into the stock market proved to be less successful than anticipated. However; share prices are still up and down and the proof of the pudding will definitely depend on time and Mr Zuckerberg’s future plans. The success of Pinterest has driven Facebook to concentrate on the image side of the business and now we apparently have bigger and better photos to enjoy on the site. However, despite Facebook’s acquisition of Instagram, images on Facebook remain buggy, difficult to crop at times and within the iOS app, pretty much useless. This is because (for me at least) often when I attempt to look at photos on the iPad app, it just shuts the app down completely. However, bugginess aside, according to analytics company Simply Measured it seems that the world’s favourite social media site jumped 65% in engagement for photos and videos from brands posted on their timeline, so it certainly would seem that it’s not hurt them too much. LinkedIn and Twitter have also changed formats slightly to include better profile images and it seems that social is catching on to the fact that images are a big draw for people. Infographics alone are popular enough but this year has seen a growing interest in web video and video infographics, proving that consumers much prefer to take things in visually via images, rather than just through blogs and articles. This is due for the most part of the user having the ability to better ‘scan’ video and creates better engagement. Saying that, there still seems to be some form of gender divide when it comes to imagery as a huge 97% of Pinterest users are women. Of course, amongst the majority of the social networks, the biggest engagement of this year has been the US election, the London Olympics and Hurricane Sandy. News travels fast across social and it seems that Twitter is the leader for this, although sometimes false reports create huge amounts of confusion. So what’s really changed? What’s there that wasn’t before? More users, more imagery, better stats on how brands such as Coca Cola have made a big impact on proving the power of social and the cover photos have made a difference to how brands present themselves. 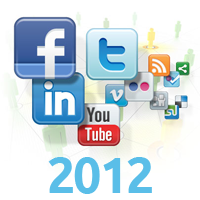 The below infographic, courtasy of Wall Blog shows the stats in more detail than we can cover here, but as the social landscape continues to change, we can expect an exciting 2013 for social media and marketing.